Despite an extremely challenging economic climate, many South African companies are taking a longer-term outlook to business by only partnering reputable providers of specialist supply chain and transport logistics services. In so doing, these discerning businesses have harnessed expert skills and capabilities that provide them with the key differentiators they need to survive in increasingly competitive markets and onerous operating conditions. Not only do these companies rely on the highest quality of supply chain and transport logistics services, but also expect their logistics suppliers to continuously innovate to pro-actively respond to changing market dynamics. Importantly, this capability needs to be provided on the back of strict compliance with exacting health and safety, as well as environmental standards. Certainly, Cargo Carriers’ long and close affiliation with South Africa’s steel, fuel, chemicals, powders and sugar industries bears testament to this unrelenting focus on Safety, Health, Environment and Quality, or “SHEQ”. These are the basis upon which this leading logistics service provider has built a 60-year-long legacy of servicing these industries. Non-negotiable and part of the company’s DNA make-up, they have also played a key role in Cargo Carriers’ ability to retain its contracts with specific operators in these specialist markets for almost 40 years. More recently, two of the company’s contracts were renewed by long-standing clients operating in both the local fuel and chemical industries. Cargo Carriers’ ability to meet and even exceed the high expectations of industry played an important role in the renewal of its contract to transport raw-tar product, or “black fuel”, a classified hazardous product, for another important client in this industrial market segment. The company provided cutting-edge supply chain and transport and logistics services to this client for almost eight years, before its contract was significantly extended. 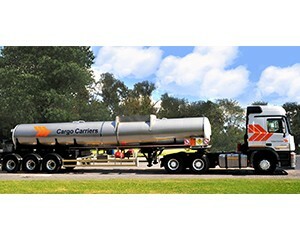 Certainly, Cargo Carriers’ leading position in the larger fuel industry is characterised by its load-and-route optimisation, enhanced load security and delivery visibility capabilities. In addition, the company’s sophisticated technologies, including the latest vehicle and trailer configurations, have helped reduce emissions in the large transport component of the industry’s value chain. This is in line with the growing “green” consciousness that has placed significant onus on businesses, especially fossil-fuel based sectors, to reduce their carbon footprints. Importantly, these technologies have also contributed towards increased payload and reduced fuel burn, helping players in this increasingly competitive industry contain logistics costs and, therefore, improve efficiencies. These capabilities are augmented by improved turnaround times on last mile distribution operations, preloading vehicles and offloading procedures, as well as ensuring close to 100% vehicle availability due to a sound preventative and structured maintenance regime. Meanwhile, an unwavering focus on SHEQ has also been the backbone of Cargo Carriers’ efficient and safe delivery of flocculants, acids, fertilisers and heavy oils. It is also the preferred transporter of oxygen, nitrogen, argon and carbon dioxide for one of South Africa’s largest gas and welding products suppliers. Certainly, the renewal of another contract with a long-standing client in the chemicals industry further reflects Cargo Carriers’ reputable standing in the larger local chemicals industry. This development will see the company continue to build on its two decade-long partnership with this client, for which it delivers hazardous product in an intricate round-the-clock operation – seven days per week, 24 hours per day – using specially designed stainless steel tankers. This complements the company’s ISO 9001:2015; ISO 14001:2015 and OHSAS 18001:2007 accreditation and affiliation to the Chemical and Allied Industries (CAIA). Cargo Carriers’ Sasolburg branch has been rated as an “accredited haulier” meeting CAIA’s stringent criteria. The Sasolburg operation is one of the branches from which the company co-ordinates deliveries throughout South Africa and as far afield as Zambia and Malawi. Importantly, the company is also a signatory to Safety and Quality Assessment (SQAS) and Responsible Care. Like its counterparts in the fuel industry, participants in the chemical sector have also relied upon Cargo Carriers’ flexibility to changing markets and circumstances. This includes unexpected seasonal changes, which had a profound negative impact on some markets for chemical products. Specifically, the agricultural industry, a large consumer of liquid fertiliser, was severely impacted by the extended drought and mines adversely affected by continuous wet weather in some regions of South Africa that brought operations to a grinding halt. Combined with high ethical values and robust Broad Based Black Economic Empowerment credentials, Cargo Carriers looks forward to continuing its long journey facilitating South Africa’s industrialisation in line with the imperatives enshrined in the National Development Plan!